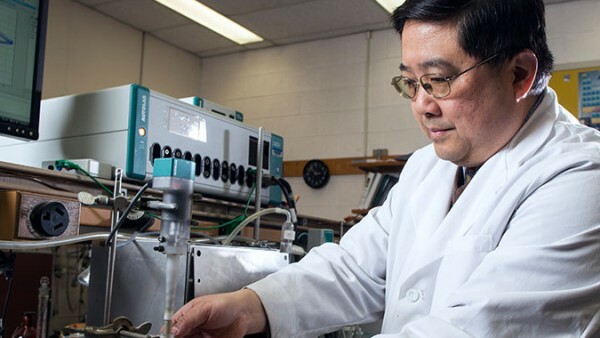 Renewable energy chemist Deyang Qu has been named as Johnson Controls Endowed Professor in Energy Storage Research. College of Engineering and Applied Science (CEAS) student Ryan Hickey in the 8th floor Johnson Controls (JCI) lab in EMS. 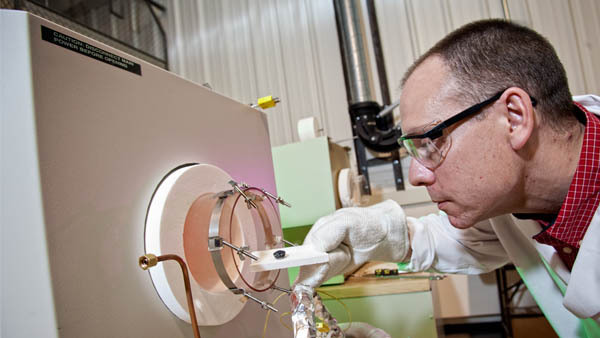 Ben Church, assistant professor of materials engineering, loads a metallic sample into a high-temperature oven in the UWM-JCI joint battery lab. Johnson Controls’ focus on the future is clear at its award-winning, one-of-a-kind campus laboratory. The lab teams its own researchers with UWM engineering faculty and students. The company also provides an endowed engineering professorship to maintain research momentum. The Energy Advancement Research Lab, located in the Engineering and Mathematical Sciences building, creates an environment for Johnson Controls scientists to work with UWM students and faculty. The dedicated space allows them to conduct research, enhance the university’s advanced energy curriculum and accelerate Johnson Controls’ exploration and development of innovative, next-generation energy storage technologies. The advanced manufacturing dry lab is the only one of its kind on a university campus in North America. The partnership was recognized in 2013 with a prestigious Edison Awards gold award, given to honor excellence in new product and service development, marketing, design and innovation. The Milwaukee Business Journal also honored Johnson Controls and UW-Milwaukee with a Eureka Award for innovation in education. The Johnson Controls Energy Advancement Research Lab enables “fast fail” experimentation to accelerate the development and commercialization of advanced energy storage technologies. This type of experimentation allows quick action to deliver against anticipated project outcomes – and the ability to stop if the outcomes are not met within a certain timeframe. More than a dozen projects are currently underway with six patents pending and 16 publications in academic journals. The Johnson Controls Endowed Professorship in Energy Storage Research is responsible for maintaining the research labs and supervising graduate students at UW-Milwaukee and UW-Madison. 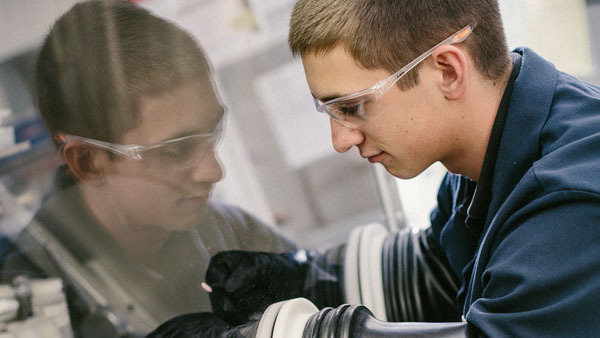 The UWM Research Foundation in collaboration with Johnson Controls has established the grant program to solicit applications from UW-Milwaukee and UW-Madison for funding R&D in systems technology, materials technology, and Manufacturing processes related to battery energy storage systems. Johnson Controls is a global diversified technology and industrial leader serving customers in more than 150 countries. Its 170,000 employees create quality products, services and solutions to optimize energy and operational efficiencies of buildings; lead-acid automotive batteries and advanced batteries for hybrid and electric vehicles; and interior systems for automobiles. Johnson Controls was honored by the UWM Alumni Association as a top corporate partner, recognizing its significant impact on the campus and on the lives of alumni and students by assisting in the advancement, growth and development of UWM. Watch how UW-Milwaukee Engineers are changing the world. Read the current magazine.